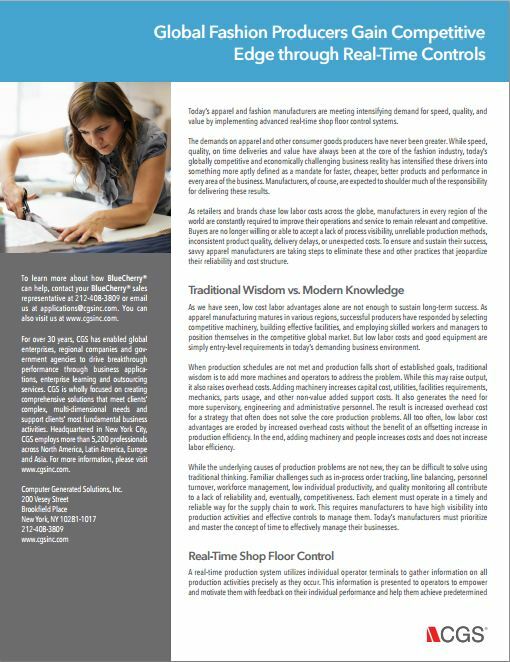 This whitepaper examines how today’s apparel and fashion manufacturers are meeting intensifying demand for speed, quality, and value by implementing advanced real-time shop floor control systems. The demands on apparel and other consumer goods producers have never been greater. While speed, quality, on time deliveries and value have always been at the core of the fashion industry, today’s globally competitive and economically challenging business reality has intensified these drivers into something more aptly defined as a mandate for faster, cheaper, better products and performance in every area of the business. Manufacturers, of course, are expected to shoulder much of the responsibility for delivering these results. As retailers and brands chase low labor costs across the globe, manufacturers in every region of the world are constantly required to improve their operations and service to remain relevant and competitive. Buyers are no longer willing or able to accept a lack of process visibility, unreliable production methods, inconsistent product quality, delivery delays, or unexpected costs. To ensure and sustain their success, savvy apparel manufacturers are taking steps to eliminate these and other practices that jeopardize their reliability and cost structure. As we have seen, low cost labor advantages alone are not enough to sustain long-term success. As apparel manufacturing matures in various regions, successful producers have responded by selecting competitive machinery, building effective facilities, and employing skilled workers and managers to position themselves in the competitive global market. But low labor costs and good equipment are simply entry-level requirements in today’s demanding business environment. When production schedules are not met and production falls short of established goals, traditional wisdom is to add more machines and operators to address the problem. While this may raise output, it also raises overhead costs. Adding machinery increases capital cost, utilities, facilities requirements, mechanics, parts usage, and other non-value added support costs.